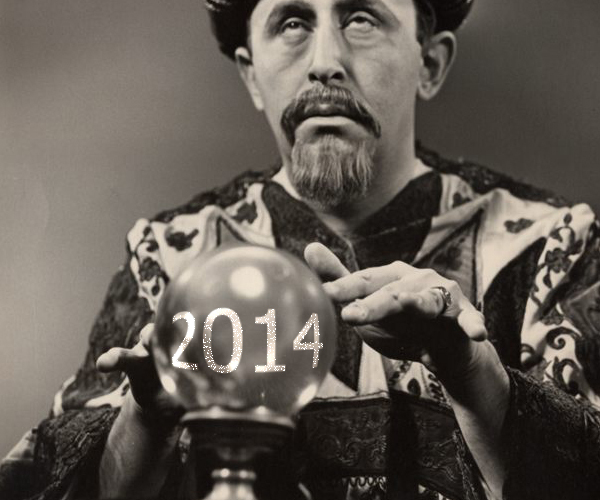 2014 AdWords predictions are they worth the pixels they’re written in? Home Ads 2014 AdWords predictions are they worth the pixels they’re written in? 2013 has come to a close and everyone is back at work and I was sat thinking about w hat to write for my first insightful blog of the year. Do I go down the route of making Nostradamusesque (is that a word?) predictions and tell you all again about how Google will make numerous changes, some good some bad, or do I tell you how the bigger online brands will get bigger and that many small businesses will struggle? Well to be honest I think I would be insulting your intelligence if I went down this route as they are fairly obvious predictions. You don’t have to be Derren Brown to figure it out. So what will I talk about? New Years has literally just gone and the hangover has cleared and I was thinking about my slightly alcohol fuelled resolutions and then it hit me, I had made several New Year’s resolutions for my personal life but what about my business. We all know that 99% of resolutions will be broken by January 31st but will it be easier or harder to stick to new business resolutions? For me it will be a lot easier as I shared these resolutions with my management team and they are all onboard to make sure we stick to them and as you know if you’ve got a buddy at the gym you’re more likely to keep going. What sort of resolutions am I talking about? Well over many years I have begun to notice a familiar pattern between those that succeed and those that fail. It’s not that my most successful clients have been blessed with a divine gift for business and the other have been hit with the ugly stick of bad business karma! I would argue that the most successful follow my advice whilst others ponder the advice and fail to act on it. 1. Work on, not in your business. This one is top of my list as it is the easiest to break. One of the biggest issues you may have realised about last year is that you didn’t have enough time. You must learn to work on and not in your business or even your career. You must learn to delegate and not get bogged down with the day to day activities and distractions. You didn’t spend enough time looking forward and outside the box to find new revenue streams or better and more efficient ways to improve your business. Now I’m betting that a lot of you were too busy working in your business to step back and work on your marketing for instance. The only way to make sure 2014 is a success is to delegate and start working ON not IN your business. If you haven’t the staff to delegate too and they must be talented staff as well, then consider out sourcing. 2. Create demand, don’t try to supply it. Unless you produce a product or service that no one else does, or you are the only person who can offer a particular product or service that no one else can, then you may struggle. Big brands are getting bigger and if you are selling a product or service that every man and his dog is offering then it becomes an out and out bidding war as organically Google seems to favour the brands and that leaves 3 spaces for the rest of you to fight over. How do you get over this? well unless you can become the cheapest then the only way is to look at what you’re offering and is there anything else which is different that you can get a jump on competitors and create a new demand? This rolls onto another point under the same banner, what is your USP? This is an oldie but a goodie. Ask yourself this, one of the earliest handheld touchscreen “smartphone” or Palm computer was windows XDA why did that not become as big as the Apple I Phone? they both worked in a similar way however Apple are now the “coolest” brand in the world why because they created a demand they didnt supply one! How? they had a USP you could download all of your music onto it and share it with all your other apple products. clever huh? clever but simple, a must in a good USP. Many people either miss this completely or never revisit there USP. Why not? Times change and so does people’s thinking, what may have been a great USP 2 years ago will have been copied many times by your competitors and is probably old hat now. If you don’t have one then why would people buy from you? There are a number of things you can consider when working out your USP, are you the cheapest, are you the best quality, do you have more buying power giving you better availability, do you have better systems in place for dealing with orders or do you have great customer services? Or is your USP something different that may never be seen by the customer? Is it your ability to load products onto your site and market them and fulfil orders more effectively than your competitors? At the end of the day a USP is a USP no matter who it is for. Once you have figured it out you can then begin to use this to focus your marketing and getting a strong message across is going to give you a better chance of attracting that all important paying customer, especially on Google AdWords. Please remember that the seeds of your current success will also be the seeds of your failure. You need to get laying more golden eggs. 3. What’s your Customer Lifetime Value? This is perhaps the key reason most AdWords advertisers fail. Too many advertisers concentrate on what it cost to get a customer and there nothing wron g with this but they never consider how to get them to become repeat customers. It’s reasonable in the current market that your entire gross profit on the first sale will go to AdWords. Now that’s not a good ROI is it? However many people don’t consider the Lifetime Value of a customer? If a customer is followed up with direct mailing, email offers, catalogues, social media or even AdWords remarketing etc. then that customer is being encouraged to repeat with you over and over again and a fraction of that cost so an initial £200 order may turn into £1000 or £2000 so you could find your cost of Adwords falls from 50% to only 5%! Makes sense huh, so what are you doing this year about guaranteeing repeat customers and improving you Customer Lifetime Value in 2014? 5. Measure, Measure and measure some more. I touched on this in my previous blogs, if for no other reason than it’s how I lost 3 stone and that’s probably on your list of resolutions for this month an yway! Constant measuring can help you reach your targets whether it is the number of responses from AdWords or email. Without measuring your progress, how will you know when to take corrective action or increase spend to capture the maximum sales? Without measuring performance against your targets, you’re effectively flying blind. As a side point I’d also recommend measuring not only AdWords conversions but overall conversions within the business and their relationship to AdWords. Buying behaviour is taking place across so many devices that Google has recently introduced estimates for conversion tracking across devices and it’s not making happy reading for SEO. Many advertisers are finding that those SEO sales are really AdWords sales that for instance start on a tablet but are completed on a laptop! Traditionally this would have been claimed by SEO, but no longer. So this is just a couple of things to get you going. My tips on how to start 2014 in the right frame of mind, but make sure you do get going because as the old adage goes “failing to prepare is preparation for failure”. I am aiming for big things this year, watch this space as having achieved our goals for last year, my aim this year is to expand our position as the UK’s leading AdWords mentoring experts and move with the times. We’re expanding the team, bringing in new expertise in many new areas to give you the best chance of success and by sticking to my New Business resolutions I am going to give myself the best chance to achieve our goals. So all the best for the New Year and remember we are here to help you stick to YOUR New Business resolutions and achieve all your goals in 2014.